Drs. Wayne and Julie Scott are well-known for their friendly, down-to-earth, gentle approach, making every patient feel comfortable and confident about their treatment, whether it’s routine or complex. They strive to know each patient personally so they can design a treatment program that will assist them in keeping their mouth healthy and beautiful for a lifetime. Drs. Wayne and Julie Scott continue to take advanced training in various aspects of cosmetic dentistry such as, veneers, bonding, all ceramic and implant crowns, as well as same day E4D crowns. Also, they have had special training in Sports Dentistry since they are the team dentist for the Dallas Cowboys Football Team and the Dallas Stars Hockey Team. Drs. 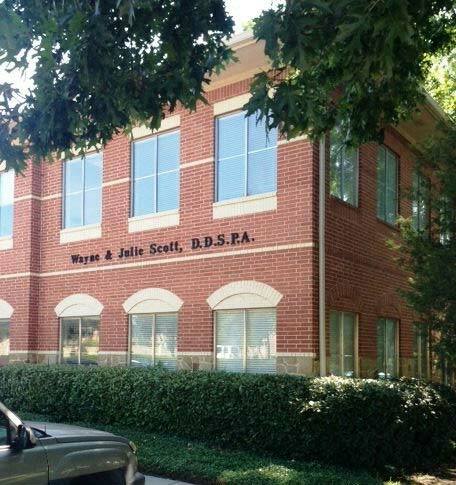 Wayne and Julie Scott have been providing dental care and mouth guard fabrication for the Dallas Cowboys since 1990 and the Dallas Stars since 1993. Furthermore, the doctors have been providing rink side dental care to the Dallas Stars Hockey Team during games to treat dental injuries. They are also members of the American Dental Association, Texas Dental Association, Dallas County Dental Society, Academy for Sports Dentistry and members of the Spear Faculty Club. I have been going to Dr. Wayne Scott for quite some time and I feel things keep getting better. The service is fast, efficient and charming. Dr. Scott always shows a great deal of care and concern for my health and even my family. I feel like I am seeing friends rather than a medical appointment. If I am uncomfortable they are always quick to respond. My teeth look their best and I do not dread a trip to the dentist. Treatment is 5 star from the moment you walk in, during procedure through checkout. Been seeing both Dr. Scotts and their group for 15 years and they have always been exceptionally outstanding. My whole family, mother, wife, children-in-laws go to Dr. Scott for their dental needs. To me the best in DFW.